Item description: Report card, dated 22 December 1862, for John Steele Henderson, a student at the University of North Carolina. More about John Steele Henderson: John Steele Henderson (1846-1916) was born in North Carolina, the son of Archibald and Mary Henderson. He attended a private school in Melville, N.C. before he entered the University of North Carolina at Chapel Hill in January 1862. Henderson left UNC in November 1864 to join the Confederate Army as a private in Company B, Tenth Regiment, North Carolina State Troops. He served throughout the Civil War, and graduated in Law from the University of North Carolina in 1865 without reentering. He later served in the North Carolina State Senate and State House of Representatives. Item citation: In the John S. Henderson Papers #327, Southern Historical Collection, Wilson Library, University of North Carolina at Chapel Hill. DEAR SIR: — During the half session, which closed on Friday evening last, (a period of ten weeks,) Mr. J.S. Henderson has been absent from Prayers 19 times, from Recitations 22 times, and from attendance on Divine Worship …….. times, — 12 of these absences from Prayers, 11 from Recitations, and 1 from Divine Worship were unavoidable on account of sickness, or excused by permission. His relative grade of scholarship in his Class is very good in the Bible, good in Latin, Greek and French and tolerable in Mathematics. Mr. H. was absent from the final examination without permission. His general deportment has been good. The next Session will begin Saturday morning, 17th January. Punctual attendance is very desirable. The means of instruction and opportunities for improvement were never greater than they will be during the coming year. The rate of Tuition will be the same as heretofore & efforts will be made to restrain the price of board within reasonable limits. 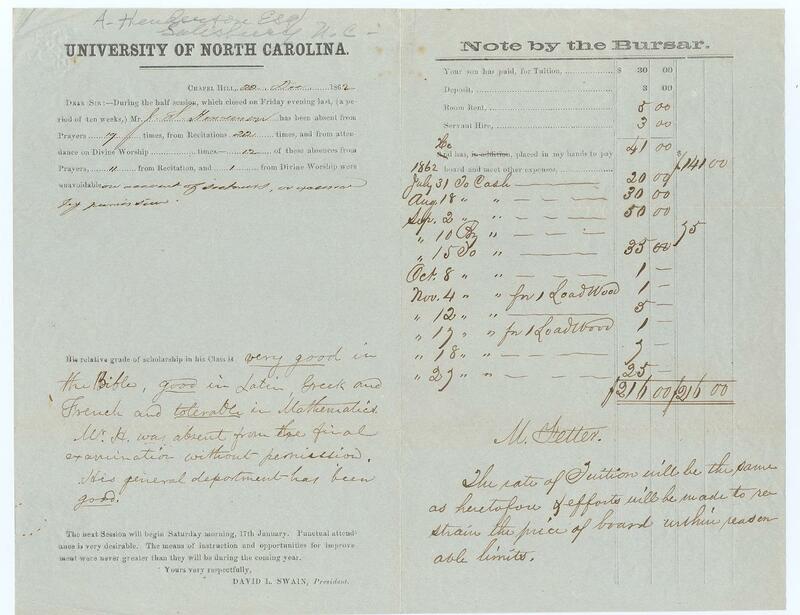 This entry was posted in Southern Historical Collection and tagged Chapel Hill, Henderson family, John Steele Henderson, North Carolina, report cards, students, University of North Carolina. Bookmark the permalink.